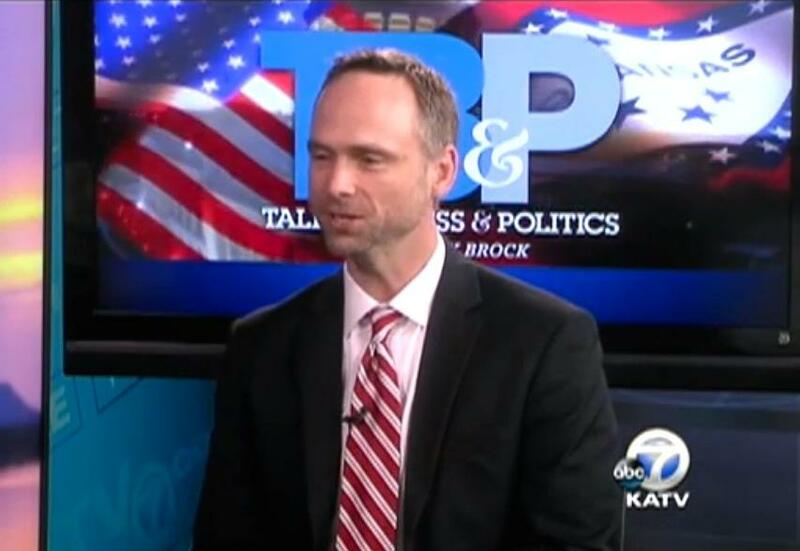 New Arkansas Surgeon General Dr. Greg Bledsoe speaking on this week's Talk Business & Politics. Arkansas’ new Surgeon General, Dr. Greg Bledsoe, says the legislative health care task force that begins its work in earnest this week will be looking at a much wider swath of reform than just the private option. Appearing on this week’s edition of Talk Business & Politics, which airs Monday evening at 6:06 p.m., Bledsoe said Gov. Asa Hutchinson’s efforts and the legislation he got passed in this recent session will be all-encompassing. Gov. Hutchinson pushed state lawmakers to fund the private option through the end of 2016. The innovative and controversial program has led 230,000 enrollees into health insurance coverage, according to the latest statistics. Hutchinson also convinced legislators to form a task force to recommend changes by the end of this year for ending the private option program by next year and to design a new marketplace for health care and insurance by the start of 2017. Bledsoe sits on the 16-member legislative task force that meets Monday to begin that challenge. As a non-voting member, he’ll still be representing the Governor’s interests to the panel. “I think this is a once in a generational opportunity to do this,” said Bledsoe, who added that a potential special session is “on the table” to ultimately address the task force’s recommendations. “When you look at the opportunity to truly remake Medicaid and remake health care in the state through these 1332 waivers, we’ve got an incredible opportunity. There’s a lot of flexibility built into the Affordable Care Act through the 1332 waivers,” Bledsoe said. When asked how eliminating individual or employer mandates could impact health insurance participation, Bledsoe said he did not have a crystal ball on if the task force would keep those mandates in a state plan or create different incentives for participation. He said one of his first meetings as state Surgeon General involved a face-to-face with Sylvia Burwell, Secretary of the U.S. Department of Health and Human Services. Bledsoe said he felt the feds would bend greatly in Arkansas’ efforts to reshape health care. Also, a U.S Supreme Court ruling, King vs. Burwell, could come down this summer. The challenge to the federal health care law is based on the constitutionality of exchange insurance subsidies created by the Affordable Care Act. A ruling against the subsidies could lead to the act’s demise. If upheld, it’s business as usual. “The governor and I and the rest of the staff have been looking at how we would respond in case they ruled against the government, against Burwell, and we have a plan in place to deal with that. But we’re not going to get out ahead of that and speculate until the Supreme Court actually makes its ruling,” he said, declining to offer more details when asked. Watch his full video interview below. The number of Arkansans with completed enrollments through the Health Care Independence Program – the private option – has reached 229,599 as of March 31, according to numbers released by the Arkansas Department of Human Services Thursday. Arkansas Gov. Asa Hutchinson says a special session will likely be needed to take up recommendations on an alternative for covering the thousands of people on the state's compromise Medicaid expansion. Hutchinson told reporters on Thursday he'd prefer that the recommendations of a task force looking at the future of the state's "private option" be considered in a special session rather than when lawmakers return to take up the state's budget next year. Senator John Boozman is touting a $16.3 billion Veterans Affairs package signed into law this week as an important move toward resolving systemic problems uncovered in April. Boozman met with medical center officials at Little Rock’s John L. McLellan Memorial Veterans Hospital Friday. The Republican from Rogers says he’s confident the state’s VA hospitals in Little Rock and Fayetteville are performing well and that reforms will prove beneficial.